Eye surgery is an essential arm of medicine and has been performed on countless patients. It is needed when there is a defect in the eye that other non-surgical means cannot cure. This covers a lot of eye defects and although glasses and contact lenses may adequately manage and even slightly correct the defect, it cannot completely be cured unless surgery is used. The common form of eye surgery is laser eye surgery although there are others. Laser eye surgery is used for several eye defects such as astigmatism and to cure diseases like glaucoma. Glaucoma is a disease of the eye which targets the optic nerve and can eventually lead to irreversible loss of vision. In fact, glaucoma is said to be the second leading cause of blindness. There is no single disease that is referred to as ‘glaucoma’ as it is a group of several diseases. Therefore, there are different types of glaucoma. These include angle-closure glaucoma, normal-tension glaucoma and primary open-angle glaucoma, amongst others. 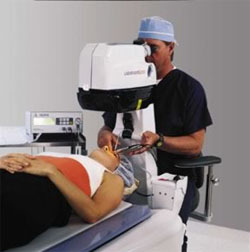 Although there are other methods of treating glaucoma, laser surgery has become the chief means. Laser eye surgery for glaucoma comes in different forms but the most common are argon laser trabeculoplasty (ALT) which is used in treating primary open-angle glaucoma; selective laser trabeculoplasty (SLT) also used in treating primary open-angle glaucoma; laser peripheral iridotomy (LPI), used in treating narrow-angle glaucoma and laser cyclophotocoagulation which is used later during the treatment procedure. The procedure would depend on the type of laser surgery the patient is having. For those who would undergo laser iridotomy for instance, which is a laser surgical procedure for angle-closure glaucoma, a hole would be made in the iris to allow fluid flow out. This is for eyes with narrow or closed angles. For those with eyes with open angels, the laser surgery to be performed would be laser trabeculoplasty. This is not a cure for glaucoma though but is used as an alternative to eye drops in managing the disease. Another process of laser surgery for glaucoma is a procedure known as laser cyclo-ablation and is used for patients with chronic glaucoma. This involves the use of laser to destroy the cells that create the fluids which put pressure on the eyes and cause blindness. Some of these procedures can be a bit painful therefore anaesthetic drops are usually applied to the eyes to numb them and prevent pain. After the procedure, some form of medication would still be needed to balance the eye pressure. Like most forms of laser surgery, the recovery time is almost immediate as the surgery is performed out patient. However, it might be advisable to arrange for transportation afterwards as the patients eyes would still be a bit blurry. The cost of glaucoma surgery using laser varies depending on the hospital and the ophthalmic surgeon. Some hospitals like the London Ophthalmic Centre in London charge £2200 not inclusive of consultation fees and others charge for other preliminary tests. It would be advisable to contact a NHS provider as this surgery falls under the category of laser eye surgeries that are covered.